The Denver Postcard & Paper Show was founded in 2001. Dede Horan, one of the co-founders, became sole proprietor in 2003 and ran three shows each year. It has been a success since the beginning. In July 2016 she turned the show over to Carol Mobley. May 3 & 4 - Expanded to include Bottles, Books, Comics, Maps, Radios, Clocks, Art, Vinyl, Stamps, Coins, and other collectibles. Some of the dealers are “regulars,” setting up at every show, and there are usually two or three dealers new to each show. The Denver Postcard & Paper Show is unique to Denver. Why? Because of the many friendly faces and the variety of merchandise at every show! It is one of very few shows in Colorado that offer a wide variety of antique and collectible postcards but also trade cards, stereoview cards, photographs and other paper ephemera. For beginning collectors there are even bargain boxes of cards starting at 25 cents each. Door prizes are contributed by the dealers. Typically these are spending certificates that can be used at the dealer's booth. Food is available on site and there is plenty of free parking. If you are traveling from out of state and need accommodations, there are a number of hotels and motels nearby. Please feel free to contact camobley@ephemeranet.com or call 720-308-1516 for more information on lodging or questions about the show. Carol Mobley has been a postcard and paper ephemera dealer since the mid 1990's. 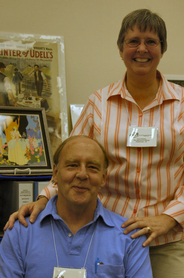 Her husband, Bill, is one of the founders of The Ephemera Society of America. When Bill first moved to Colorado in 1996 he began to teach me about paper ephemera. I was hooked immediately. I love history and the story that each piece of ephemera has to tell. Whether it be a postcard, photograph, trade card or any other type of paper collectible I find them all fascinating. I am learning more about postal history and am expanding my inventory to include RPO (Railroad Post Office), DPO (Dead Post Office) and other cancellations of interest. Since becoming involved in ephemera I am a past president of the Denver Postcard Club and still remain an active member. I am a member of the Rocky Mountain Philatelic Library, Rocky Mountain Antiquarian Booksellers Association and The Ephemera Society of America. Be sure to check out The Denver Postcard & Paper Show Facebook page.